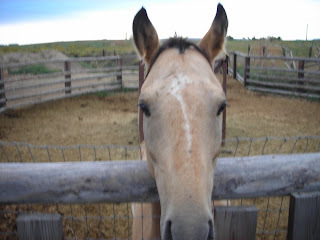 It was only a matter of time before horses showed up on this blog. I've never been a cowboy, but I grew up around horses, ride pretty well and ended up with a gal who lives and breathes them. When I met Joanne, she was spending summers guiding pack trips in the Teton Wilderness. I joined her a few times, and they are great memories. We're talking 5-10 days completely off-the-grid: several paying guests, a wrangler, a cook, a "boss" (Joanne), 10-15 horses, covering 20-60 miles, camping, dutch oven cooking, fishing at lakes that see only a few people each year, coming upon herds of 200+ elk, grizzlies, and views that overwhelm the senses. If you want to truly "get away," pack trips are the answer. Joanne's family had a dude ranch just outside Dubois, WY throughout her childhood. They sold the ranch when she was in college, but still own some acreage down the Wind River Valley, near Riverton. It's filled with sandhill cranes, lots of horses and even a few Mules . Anyone who has spent time around horses knows they entail a lot of work, which seems to be part of the appeal to "horse people." It's also why horse people are some of the highest-character folks you'll meet. 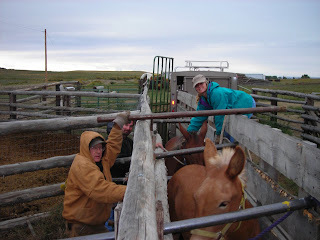 Here are Joanne, her dad and brother working with a couple of their mules yesterday. 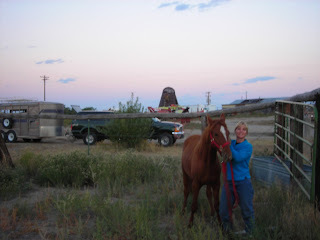 Our weekend was spent driving three horses over Teton Pass and Togwotee Pass to the big pasture ground near Riverton. After a nice family get-together, we then loaded two mules up for the trip back to Driggs. Construction over Togwotee is pretty intense at the moment, but otherwise it's a beautiful drive. It was the first time I had driven a loaded trailer over Teton Pass, and I was sure glad all the gears and brakes worked. I also realized why it's so hard pedaling a bike up there...that bugger is steep! I'll leave you with a photo of Rio, the Tennessee Walker stud horse, wondering what we're doing on his turf.